Available in 2 colours - water clear (legacy material) and red for normal cleaning and protected storage, the dye giving a very clear indication of the protective coating. note: water clear and red coatings are used in exactly the same way. 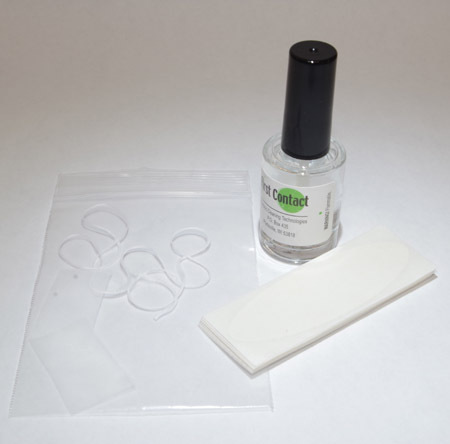 New for 2015 the 15ml applicator packs now come with some peel tabs and samples of the unwaxed floss andinert nylon mesh (as pictured) providing three methods of removal of the cured polymer. 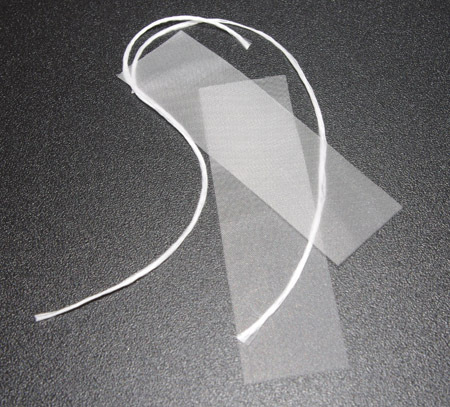 The floss and mesh are designed to be embeded in the polymer while its being applied and then can be used for polymer removal. Quote from customer John M Sonley - I've just completed the exercise of treating all my 1st surface holography mirrors in my current holography table set-up with First Contact - fantastic results! The small red dot produced on each mirror from my unexpanded 33mW HeNe is far less visible now - suggesting less scattered light and a much cleaner surface. I left the polymer to dry and harden for 24 hours and it came away from each optical surface so easily. Easily the best way to clean optics. Simple to use and effective at leaving the surface spotless. Takes some practice to get it right, and patience to leave it long enough before removing but nothing comes close. Although £24 sounds expensive for a small bottle i can honestly say it is worth it. As mentioned in the description, it provides an excellent way of preventing contamination of mirrors when equipment is in transit or not being used for a period of time. I found It extremely easy to apply, and once dry leaves a very thin film (a bit like cling film) across the surface. In my case It was then a case of simply touching the surface of the dry film with a small piece of masking tape and the whole lots lifts off.